Looking for a good Goruck alternative? We’ve done the research to bring you 7 different affordable options to the popular Goruck GR1 backpack. The GR1 is a quality USA made backpack with tons of great features like a laptop compartment, external molle, and a hydration access port. It comes in 21L or 26L options which are the great sizes for everyday carry. The backpacks on this list have many similar features as the Goruck GR1 but at a much lower price point. Take a look at our reviews below to explore the unique features each of the backpacks have to offer. One of the main selling points of Goruck bags is the versatility that is embedded into each bag’s design. The Goruck GR1 is the perfect blend of civilian minimalism and tactical functionality. It’s such a good design that other backpack brands were quick to mimic some of it’s best features. While few bags can offer everything that the GoRuck GR1 offers, a few brands do come close. Here are our favorite bags like GoRuck for anyone looking for a good GR1 alternative at a cheaper price point. 5.11 Tactical offers a cheaper GoRuck backpack alternative that rivals the GR1 in design with their Rapid Origin Pack. At a 25 liter capacity the Rapid Origin Pack sits at a comfortable middle ground between Goruck’s 21L and 26L GR1 options. Made out of a tough 600D polyester, the 5.11 Rapid Origin pack is built to withstand everything from rucking to everyday carry. For those looking for an American made bag, you’ll be disappointed to find that 5.11 manufacturers their bags overseas. But the tradeoff is a much cheaper price point for a lot of the same feature you will find in the more expensive GR1. If minimalist design, a clamshell opening and MOLLE attachments are what you are looking for, then the 5.11 Rapid Origin Pack is the best GoRuck alternative on the market right now. The Propper U.C. backpack is easily one of the best Goruck GR1 alternatives available today. The “U.C” stands for “user configurable”. It’s design includes molle webbing on all three sides of the backpack as well as the shoulder straps, allowing full customization where you need it the most. The interior is lined with soft-touch loop allowing for attachment of hook-and-loop ad-ons. Some of the best features of this backpack are it’s smart pocket placements. On the top you have small easy access pocket for small items such as sunglasses. The bottom of the bag features it’s own separate compartment to keep dirty items such as clothes or shoes. Access to main compartment is a breeze with it’s clamshell design that allows full access to the contents inside. There is a padded sleeve for laptop or tables inside the main compartment. Clamshell access to the main compartment. Easy access top and side pockets for small items. The Condor Frontier Outdoor Pack is a tough backpack made for both outdoor and urban exploration. It’s small form factor allows for great everyday carry without being too bulky. The backpack is made of durable Mil Spec 500D Cordura and features YKK zippers with paracord pull cords, Molle attachments on the front and sides, and a specially designed back to increase airflow when worn. All of these great features make the Condor Frontier Outdoor Pack a great Goruck alternative. Inside you can find 3 different compartments. Inside the main compartment there is a laptop sleeve and document pouch. The smaller front pocket opens flat for east access to the internal organizer for pens and other smaller items. The hydration compartment can be found in the back pocket. This backside compartment can hold up to a 2.5L bladder and includes tube access from the outside. No matter how full the backpack is you can expect a comfortable wear thanks to the padded shoulder straps, sternum strap and it’s removable waist belt for extra support. Main and Front compartments open flat. The Camelbak H.A.W.G is a quality made backpack tough enough for hikes and rucks. It’s main feature is the included Mil-Spec Antidote Reservoir water delivery system that includes a 3 liter water bladder and Quick Link Hydrolock Bite Valve Adapter for easy refilling and use. The backpack itself features 2 full length main compartments to keep your items secure and organized. The 500D Rip-Stop Cordura is water resistant and MOLLE on the front panel allows for attachment of extra gear. At 23L capacity, the Camelbak H.A.W.G is large enough for your essentials while remaining compact enough to take on a day hike or to use as a daily urban backpack. We highly recommend the Camelbak H.A.W.G to anyone looking for a cheaper quality Goruck backpack alternative for adventuring. Foam back panel and EVA foam shoulder harness for comfort. Includes a Mil Sepc Antidote reservoir water bladder and exit port with tube. The Q Laptop Backpack by Timbuk2 is great Goruck GR1 Alternative for those of you who enjoy a similar minimalist design but need a backpack for more urban settings. The Timbuk2 Q Laptop Backpack is a great quality backpack made for everyday laptop carry and travel. The laptop compartment zips open on the side of the bag for quick access at airport TSA checkpoints. The main compartment is roomy enough for everyday essentials with it’s 26 liter capacity and plenty of exterior pockets for electronics chargers and other small items. The side mesh pocket is perfect for a water bottle or umbrella. As for comfort the Timbuk2 backpack featured padded adjustable shoulder straps and an air mesh back for circulation and comfort when wearing. There are no molle attachments or hydration pockets on this laptop which gives it a less tactical look than the GR1. But for anyone who wants a similar design with tons of great features, the Timbuk2 Q laptop is a highly recommended choice. The 5.11 Rush 12 backpack is a compact tactical backpack made for everyday functionality. The backpack can be broken down into 3 compartments: A roomy main compartment, a smaller bottom front compartment with organizational pockets, and the 1.5 liter hydration pocket for your water bladder. In total, the Rush 12 backpack features 16 different compartments for a variety of items and uses. This includes the fleece-lined pocket for your sunglasses and internal organizer for pens, notepads and other small items. There is no dedicated laptop compartment but a laptop up to 14 inches can easily fit in the main compartment. The outside of the backpack features an adjustable height sternum strap as well as a contoured yoke shoulder strap system that is adjustable for a comfortable fit. You can also find MOLLE attachments along the front and sides of the exterior of the backpack for the ability to add additional items to your load.The water-resistant 1050D Nylon makes this a great backpack for commuters and outdoor enthusiasts alike. MOLLE attachments on both front and sides. The Cannae Legion Day Pack is a backpack built from the ground up for military and law enforcement professionals but it’s practical and useful features also makes it backpack for casual everyday carry. The main compartment opens flat for easy access to your gear. Inside you will also find multiple organizational pockets including a padded laptop sleeve. Mil-Spec MOLLE attachments and heavy duty D-rings can be found on the exterior front and sides of the backpack. The front of the backpack also features two smaller zip pockets. You will also find easy access side pockets that are useful for carrying water bottles and extra ammo magazines. We recommend the Cannae Legion Day Pack to anyone looking for a quality Goruck alternative at a cheaper price point. Back zipper compartment holds 2L hydration bladder. Unlike some of the other backpacks on this list, the Griff Pack was designed for concealed carry in mind. Everyday carry buffs will love the look, feel and functionality of the Griff Pack. One thing to note: This backpack runs a bit larger than the GR1 at almost 30 Liters in capacity. The backpack itself has many great features worth noting. The bag has two roomy main compartments that serve different purposes. The first front main compartment features a clamshell zipper that allows the backpack to lay flat when opened. The second back main compartment has a fully padded laptop sleeve as well as loops for attachments of holsters or magazines. The back of the backpack features two access doors that allow you to draw your weapon from the second main compartment while the backpack is being worn. Clamshell access to the front main compartment. The following brands are for anyone who loves the features of the Goruck GR1 and GR2 but are still curious about the competition. Getting to know your options before a big purchase is a must and luckily there are a few brands that rival Goruck in both quality and design. Like Goruck, these 3 brands offer American made backpacks with a focus on innovative design and craftsmanship. For those who value build integrity, you are going to love what the following brands have to offer. Based in Montana, Mystery Ranch makes all of their packs in the USA. The brand has a special relationship with supplying bags for the military which started when the Mystery Branch was approached to make special packs for the Navy SEALS in 2004. Since the brand’s beginning, Mystery Ranch has been known for their dedication to quality, durability and function. One of our favorite bags is the Mystery Ranch ASAP pack which is the most compact version of their 3-zip series assault packs. The backpack features a unique Y zipper design that allows you to open the backpack from the top like a rucksack and down the middle so that the entire main compartment is easily accessible. The Brown Buffalo is an up and coming brand that focuses on design-driven packs, backpacks and travel accessories. The brand does a great job of striking a balance between style and function. Those who love the minimalism of Goruck bags will be impressed by The Brown Buffalo Conceal Backpack. The are two versions of the Conceal backpack; an American made version made of ballistic nylon Cordura and a slightly cheaper Water-resistant 420D Nylon version made overseas. These bags are perfect for anyone who wants a more urban backpack for everyday carry but doesn’t want to compromise on the craftsmanship and attention to detail that many tactical bag brands like Goruck provide. Expertly designed. Tough as nails. Made in USA. Triple Aught Design offers some of the most thoughtfully designed American made tactical and urban carry backpacks. Their FAST Collection of backpacks offers some great options for those looking for smaller rucksacks with must-have features such as room for a hydration bladder, hip belt and plenty of MOLLE attachments. We recommend the FAST Pack Litespeed for anyone looking for a medium size rucksack at around 22L capacity. Although more tactical than the minimalist GoRuck GR1 and GR2, Triple Aught Design’s commitment to quality makes their bags worth a closer look even if you are just looking for a casual everyday backpack with tactical features. Here is a quick rundown on how we chose the backpacks on our list. We made it a point to judge each backpack by how they compared to the Goruck GR1 in style, function and build quality. The first thing you notice when shopping for a bag is it’s style and design. Goruck has a very specific tactical minimalist style that combines the functionality of a tactical rucksack with a more toned down design. What you get is a military grade pack that can be worn just about anywhere. While it can be tough to nail down Goruck’s minimal look, the backpacks on our list do a good job at keeping things simple. Each bag, with the exception of the Timbuk2 Q laptop backpack, include the typical tactical offerings of MOLLE attachments and sternum or waist straps without going overboard with too many bells and whistles that distract from their overall design. Bags like the Propper U.C. backpack and the Grey Ghost Gear Griff Pack are great examples of this simplicity in play. Both bags look like regular backpacks with the exception of front facing MOLLE webbing or in the case of the Grey Ghost Gear Griff pack, some tastefully placed velcro for morale patches on the front pocket. One of the most popular design features of Goruck backpacks is their clamshell design that allows for the main compartment to open flat. Every backpack on our Goruck GR1 Alternative list shares this clamshell design with the exception of the Camelbak H.A.W.G. and Timbuk2 Q laptop backpack. When it comes to rucking backpacks, the GoRuck GR1 pack is on the smaller side at only 21L and 26L respectively. All of our top picks follow in the same footsteps with the largest backpack being the Grey Ghost Gear Griff Pack at almost 30L capacity. If you are looking for a Goruck GR1 alternative on the smaller side then we recommend the Cannae Legion Day Pack that offers a 21L capacity just like the smaller Goruck GR1. Along with great design, we took a close look at the functionality each bag had to offer and how it compared to the Goruck GR1. What we found was that many backpacks had some if not all of the same functionality of the Goruck GR1 but at a cheaper price point. The Goruck GR1 backpack features 3 rows of MOLLE webbing on the front, side and inside of the pack and additional MOLLE webbing on the shoulder straps. This allows the pack to be loaded up with additional storage and gear attachments. Unlike other tactical bag designs, the simple MOLLE placement on Goruck packs is a popular selling point. Goruck keeps the MOLLE attachments to a minimum while still providing plenty of options for adding gear as needed. We think that the Propper U.C. backpack and Camelbak H.A.W.G. are excellent example of bags like Goruck that keep their MOLLE webbing design simple. But if lots of MOLLE webbing is your thing, we recommend going with the 5.11 Rush 12 backpack which is fully loaded with MOLLE webbing on the front, sides and shoulder straps. Goruck includes an exit port for a hydration tube in each one of their GR bags. We made sure to look for similar backpacks that support hydration bladders. If you are looking for a backpack similar to the Goruck GR1 with hydration bladder support our favorites are the Camelbak H.A.W.G. which supports a 3L water bladder and the Cannae Legion Day Pack which supports a 2L hydration bladder. Goruck makes the rucking backpack with the GR1 pack and we made sure to look for similar bags that can hold up to the rigorous needs of a ruck event. One main feature we looked out for is each backpack’s ability to hold ruck plates. The best we have found is the Condor Frontier Outdoor pack, a smaller backpack that has a robust laptop compartment that can hold one or two plates as well as a separate water bladder compartment that can double as a ruck plate compartment. 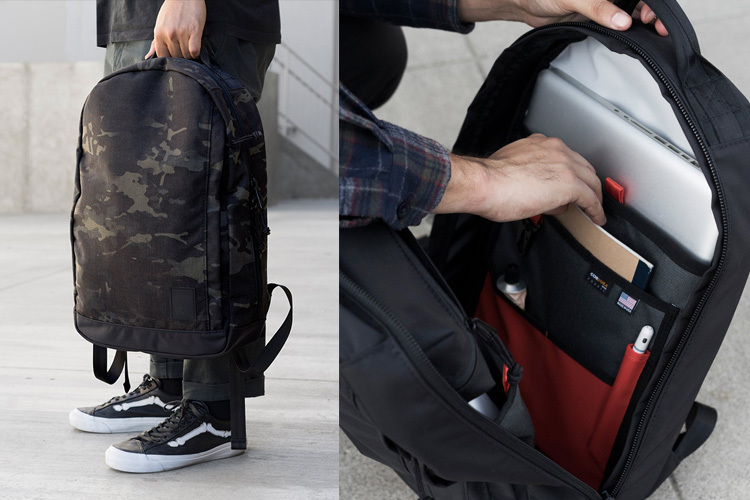 Other backpacks that can also comfortably hold ruck plates in their laptop compartments is the 5.11 Origin Pack, 5.11 Rush 12 and the Cannae Legion Day Pack. Each of the backpacks were handpicked with everyday carry in mind. Whether you are in law enforcement or a student, the bags on this list should have the ability to carry daily items such as laptops and extra clothes. Since each backpack has some sort of MOLLE webbing or velcro attachment, those looking for a Goruck camera bag will be able to attach a camera field pocket for easy storage of camera bodies and lenses. Some people simply want something like a Goruck laptop bag without too many of the tactical features. In this case we recommend the Timbuk2 Q laptop backpack for the most urban carry features such as room for your laptop accessories, books, water bottles, etc. Build quality is what separates Goruck bags from other similar tactical backpacks. Goruck proudly claims their bags are “bomb proof”. This is achieved by building a bag from the ground up with the very best materials and extensive testing to make sure the bag holds up to heavy use. We chose bags that can compete with the Goruck GR1 in terms of quality but at a cheaper price point. Goruck GR1 backpacks are made of 1000D Cordura, YKK zippers and ultra tough stitching that is strength tested at over 400lbs. Although few brands come close to Goruck’s material durability we did find some solid competitors. Both the Propper U.C. backpack and 5.11 Rush 12 are made of ultra tough 1000D and 1050D Cordura respectively. While brands like Mystery Ranch, Triple Aught Design and The Brown Buffalo all offer meticulously designed backpacks that compete with Goruck in terms of American made build quality and materials used. Very few brands can beat Goruck’s Scars lifetime guarantee. The guarantee covers defect in workmanship and materials on any Goruck product for life. But we did find some brands that offer impressive warranties with their backpacks. Timbuk2 and Camelbak both offer a lifetime warranty on all of their bags and backpacks. Cannae offers a 1 year warranty with each of their bags. Lastly, a big factor in which backpacks to include in this Goruck backpack alternative list was whether or not each bag was easily available in stores or online. Goruck backpacks are not currently available on Amazon, but we made sure to include Amazon available bags. If Amazon isn’t your thing than you’ll be pleased to know that these bags are also available on each manufacturer’s website respectively. We made sure not to include any special edition backpacks that had limited runs and instead focused on staple designs from each brand we featured.